1. Keep the bag in the middle of roof racks, not upside. 2. A big bulk on the roof may add wind drag when you drive in high speed. So if possible, it will be better to stay it in vehicles when on the highway. 3. In case there is any loosen from the straps, please tighten them every time when you stop for rest. 4. If you use the bag to pack sharp or hard objects, please wrap the contact area between the bag and the objects by soft materials, such as towel or something else. It can keep the bag undamaged and reduce the noise because of rub. 5. No enough people, maybe it is a good solution to mount the bag on the roof first before loading it. 6. Keep the LOGO to the Front, keep the two zippers to the back and meet under the velcro flap. For 30 days after the date of purchase, return your undamaged CZC AUTO product and receive a full refund for any reason. 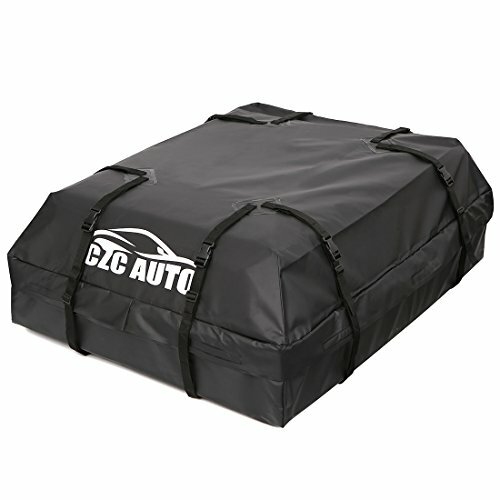 WEATHERPROOF: Our roof cargo carrier storage is made of PVC tarpaulin nylon, Welded seams technology and velcro flap design keep it totally weatherproof, can protect your luggage from rain snow wind sun dust and road grid. SPACIOUS CAPACITY AND FITMENT TYPE: Big 15 cubic feet capacity, with overall size 44"x34"x17", can sit suitable on cars SUVs vans sedans with side rails, cross bar, basket or rack. SAFE STEADY DURABLE SOFT: Use safe premium material, poisonless and harmless. PVC tarpaulin nylon is extremely steady and durable. Soft side permit to load odd-shape and oversize objects. After using, you can fold it to compact 11.8"x5.1"x12.6" and then find a small place to store it. EASY TO INSTALL: 3 sides zippers can allow the loading more simple. 8PCS ajustable build-in tie straps ensure your luggage safety and make the operation easy. CLIENT SUPPORT: Please Feel Free to Contact Us at First If There is Any Problem When You Receive or Use Our Products. We are Always Here to Support You. If you have any questions about this product by CZC AUTO, contact us by completing and submitting the form below. If you are looking for a specif part number, please include it with your message.